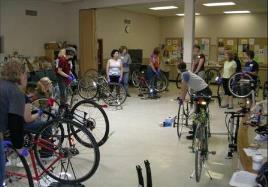 Columbia residents learn how to perform bicycle maintenance and repairs. Columbia, Missouri is home to 108,500 residents, over 30,000 of which are students at the University of Missouri-Columbia. Although many residents and students bicycled in town, formal bike infrastructure was limited to the nine-mile portion of the Katy Trail, which passed through Columbia. Envisioning a more complete network of bicycle facilities in town, Columbia residents Ian Thomas, Chip Cooper, Terry Skinner, and Mike Snyder formed PedNet on Earth Day 2000. The goal of PedNet was to use grassroots advocacy to increase the use of pedestrian and bicycle infrastructure while building public awareness and advocacy for new infrastructure connections and improvements throughout Columbia. 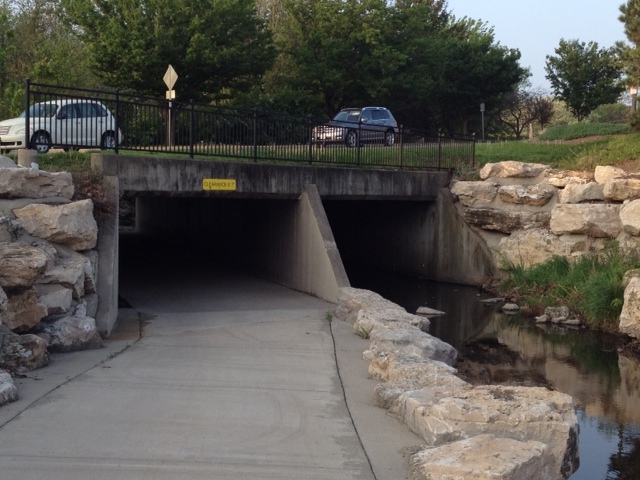 A grade-separated road crossing added to an existing culvert. At the time, PedNet could count on the support of former Columbia mayor Darwin Hindman, an outspoken advocate of nonmotorized transportation. PedNet and the City of Columbia worked closely together to apply for grant funding from different sources. In 2003, PedNet received $200,000 from Active Living by Design to develop an integrated bicycle and pedestrian network. The project, called "Bike, Walk, and Wheel: A Way of Life in Columbia, Missouri," encourages Columbia residents to take up walking and biking through Safe Routes to School programming, positive messaging, and changes in the physical environment. 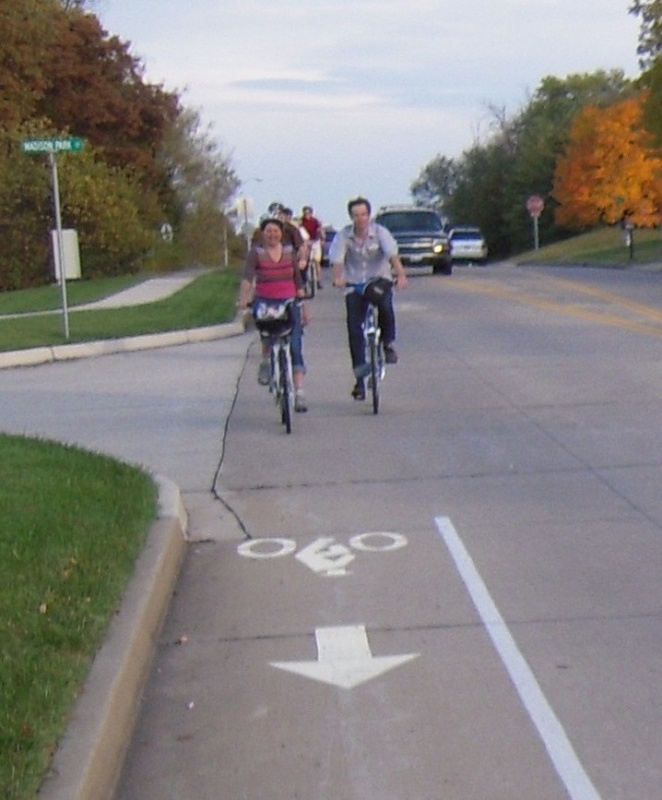 Infrastructure improvements included a one-mile urban loop trail (coupled with a walking incentive program), and the approval of new Complete Streets construction standards in 2004. The program also gave away 500 refurbished bikes along with free bike helmets provided by the SafeKids coalition, and PedNet offered (and continues to offer) bike safety and repair classes to children and adults. Bicyclists use one of the bike lanes. In 2005, PedNet won five new grants, totaling $240,000, to expand their active living and public policy work. PedNet also led a strong campaign to support the approval of a sales tax to fund sidewalks and traffic calming around elementary schools, which was passed in November. However, the largest influx of funding occurred in July of that year, the City of Columbia became one of four cities nationwide to receive a $25 million grant from the federal government under the Non-motorized Transportation Pilot (NTPP) Program for building sidewalks, bicycle lanes, and shared-use greenways to connect community activity centers such as schools, businesses, and transit stations. The City of Columbia used the funding to create GetAbout Columbia in the Department of Public Works to implement the infrastructure improvements and chose PedNet to lead the educational component of the program. GetAbout Columbia's guiding philosophy was to promote an increase in walking and biking while providing the infrastructure to support it. 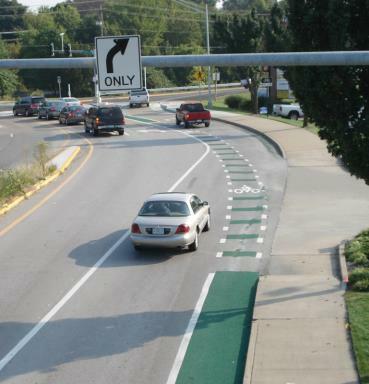 One of two green merge-and-weave intersection treatments. The project was evaluated using funds set aside by the City of Columbia and support from the Non-motorized Transportation Pilot Program (NTPP). Prior to receiving the GetAbout grant, the City of Columbia was more bike-friendly and active than many towns in Missouri, but the lack of bicycle infrastructure made it difficult for many students and commuters to use their bicycles for trips and errands in town. A series of counts taken since 2007 have shown how bicycling has increased since the early years of the GetAbout program. A series of counts taken between 2009 and 2013 recorded an increase in walking of 22 percent and an increase in bicycling of 44 percent. Specific bike count locations that were the site of improvement projects registered even greater increases in the number of bicyclists. For example, at the intersection of Providence Road and Stewart Road, an improvement project completed in 2009 reconfigured the intersection, added crosswalks and sidewalks, and improved striping for pedestrians and bicyclists. The project provided an important connection between multiple destinations and between 2007 and 2013, the number of bicyclists recorded at this intersection increased by 98 percent. Some of the promotional materials created to encourage walking and biking. As is often the case when the number of bicycle trips increases, the City of Columbia also recorded a greater number of reported bicyclist injuries. However, an analysis of the number of injuries per million bicycle trips indicated that the rate of bicyclist injuries has largely decreased over time. While in 2002, there were 14.1 injuries per million bicycle trips, in 2012, there were 8.4 injuries per million bicycle trips. Because of the relatively small number of bicyclist fatalities, the number of fatalities was pooled across the four communities that received NTPP grants and compared to the number of bicyclists to understand changes in the rate of fatalities in all four communities (the other three communities were Marin County, CA; Minneapolis area, MN; and Sheboygan County, WI). The results of this analysis indicated that bicyclist fatalities decreased from 13 per 1 million bicycle trips in 2002 to 4 per 1 million bicycle trips in 2012. The former mayor of Columbia, Darwin Hindman, said that conditions for bicyclists have improved tremendously since he took office in 1995. He said that bicyclists were a rare sight on Columbia streets in 1995. Today, bicyclists are a common sight, especially downtown, on the campus of the University of Missouri, in the neighborhoods around downtown and the university, on the trail network, and in the neighborhoods close to trails. It is also not uncommon to see bicyclists in less bicycle-friendly locations where bicyclists were nonexistent before. 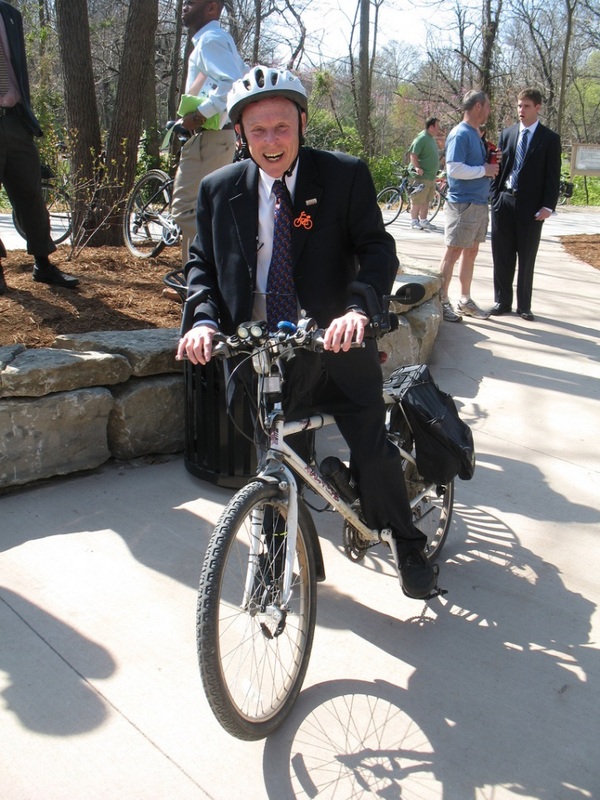 Former mayor Darwin Hindman prefers to make trips by bicycle. PedNet began as a grassroots effort in 2000, and successfully worked on different grants, projects, and campaigns from the outset. Having an active advocacy organization in place such as PedNet was instrumental for receiving funding from Active Living by Design and the NTPP, but the success of different projects also depended on cooperation and collaboration between different organizations that were working together toward achieving the same goals. In expanding Columbia's bicycle network, GetAbout Columbia emphasized connectivity between new and existing segments of bicycle infrastructure. Where large roads and intersections, railroad tracks, or natural features such as rivers and streams acted as barriers, solutions were both conventional (e.g., intersection redesign) and unconventional (e.g., the expansion of existing culverts for use as bicycle underpasses). By using a wide of array of solutions to site-specific challenges (e.g., using wide sidewalks where bicycling was allowed where arterial conditions prevented on-street facilities), bicycle infrastructure could be tailored to existing conditions. One piece of advice from the GetAbout team was to expect initial skepticism from the community and offer the possibility of pilot implementation to build support for a project. 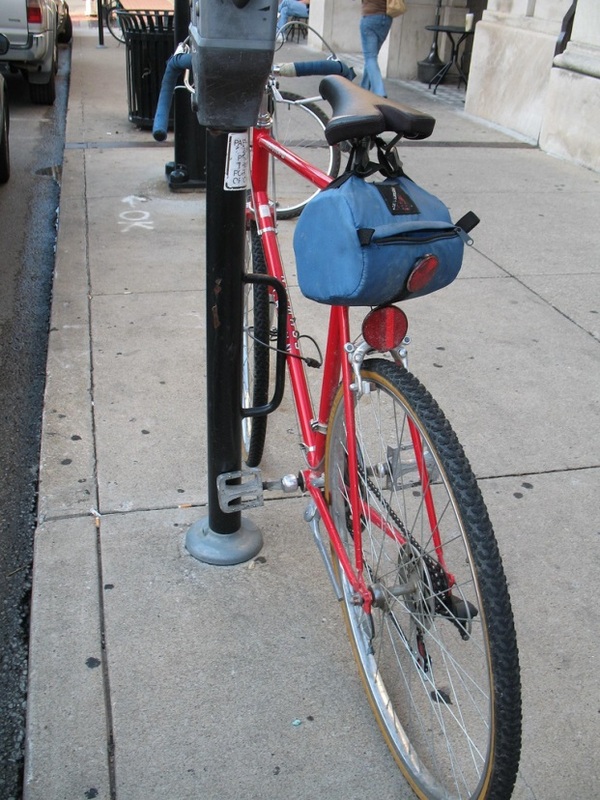 Parking meters in downtown Columbia are outfitted with metal loops for bike parking. In general, it was easier and quicker to implement on-street infrastructure projects and outreach programs than it was to complete off-street infrastructure projects. Some of the most successful outreach and marketing efforts were major, recurring events, Safe Routes to School programs, and giveaways, like when police officers gave out bike lights. Competency classes for adults were considered effective because 40 percent of participants said that they would bicycle more; however, competency classes only attracted about 100 participants per year. Media campaigns were somewhat successful in promoting active transportation, but they may not have been as cost-effective as other strategies. Though marketing and outreach were generally seen as less effective in increasing bicycling in the long-term than infrastructure improvements, they were valuable in increasing collaboration, communication, and capacity between different agencies and stakeholders. Of the $22.4 million allocated to GetAbout Columbia, 40 percent was used to install on-street infrastructure, 43 percent was used for off-street infrastructure, 16 percent was used for outreach activities, and 2 percent was used for bicycle parking. 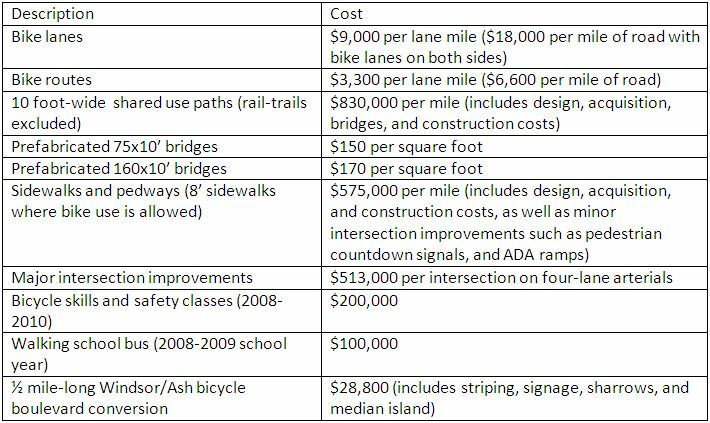 Some of the costs of infrastructure improvements are detailed in the table below.